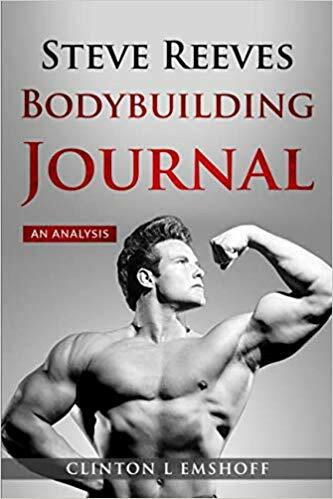 "As many of you know I have been writing a book on Steve Reeves' bodybuilding journal that he recorded his workouts in from 1946-1947. I appreciate the help many of you have given me on this project. The book is now complete and available on Amazon. I felt like this information should be seen by everyone so the print version is only $19.99 and the eBook is only $9.99. It includes a full scan of his journal as an appendix. All exercises and workouts have been broken down with extensive analysis and charts for today's bodybuilder. Enjoy!" In an earlier article the wrestler's bridge exercise, a super neck developer, was explained. It was mentioned that another type of neck movement which involved an apparatus would be discussed soon. Here then is that neck exercise and some of its variations. It's for those who find the wrestler's bridge movement too hard at this point. The exercises explained here are done with a head-strap. 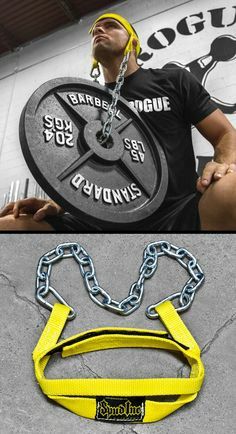 Weight can be added for more resistance. Any of these exercises will do much to build the neck, strengthen and guard it against whiplash accidents, and keep one's chin from multiplying . . . thus making these neck exercises very important to the bodybuilder. You can brace your hands upon the knees if you so desire. Move head up and down for 10-15 repetitions, or as many reps as it takes to pump up the neck. Repeat the exercise if necessary until neck feels tight. A variety of this exercise is to move the head from side to side. This side action involves the sternocleidomastoid muscles that help to give the neck that wide, muscular look. However, if you're not accustomed to doing too much neck training, don't go about it too vigorously at first. Neck strain can result, and while it's not painful it is very uncomfortable. Avoid this. For added variety the position of the neck-strap is reversed, with the weight hanging behind rather than in front of the head. This exercise is best done while seated, and exercises of this type are more effective for keeping the chin firm. This exercise can also be done while lying on a bench with the head off the edge. In this position a dumbbell or weight plate is padded with a towel and placed and lightly held on the forehead and the head is moved up and then allowed to be lowered again. The exercise imparts great stress upon the chin area and sternocleidomastoid muscles. Once the neck has been toughened up it can be exercises every day,j and actually SHOULD be trained every day if one hopes to reduce the extra chins and looseness that may have accumulated over time. In any case, five days per week is not excessive, although everyday training will bring faster results. High reps should be employed when there is a reducing problem such as multiple chins. This can be anywhere from 15 to 25 consecutive repetitions, and repeating this number in two or more sets. However, as mentioned earlier, don't be too vigorous at first. Work up gradually. How Fast Should I Squat?